Panoramic View from the Overlook at Dupree Preserve. Author's collection. 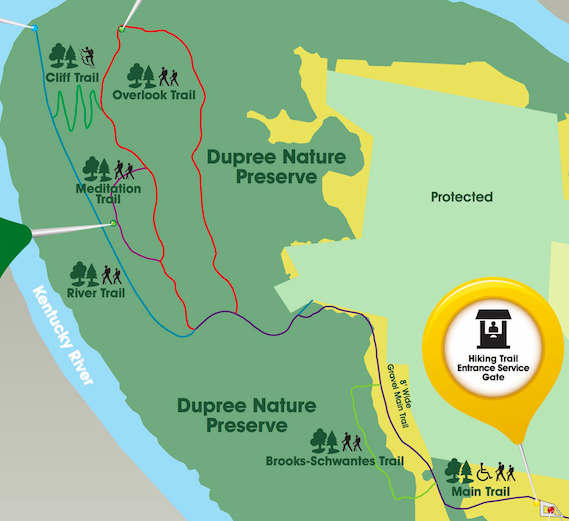 Map of the Dupree Preserve. Preserve. Twice over as many months I've taken my two kids, ages 3 and 6, for a hike in the woods. There are few activities that are more fun with kids. Hiking removes them from "screen time" and, under these circumstances, they are happy for the break! They are exposed to nature and my inquisitive 6 year old loves to learn, so I relish the opportunity to take him to such an "outdoor classroom." One of central Kentucky's newest nature preserves and hiking trail opportunities exists in Garrard County at the Dupree Nature Preserve. The preserve opened in October 2013 with the last of the trails, the Cliff Trail, being completed in August 2014. Its 300 acres features savannah, woodlands, views of the Kentucky River and the Palisades, and interpretive materials along the 5-miles of trails. 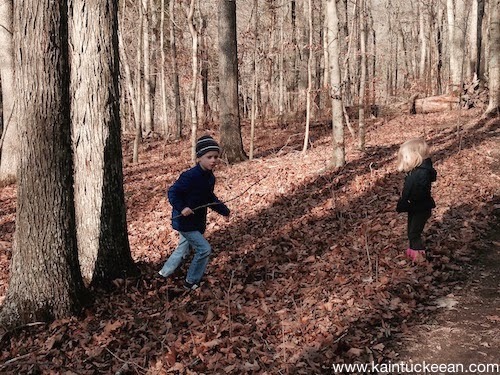 The kids, ages 6 and 3, walking the trails at Dupree Preserve. Author's collection. None of the trails at Dupree Nature Preserve are truly difficult. The most challenging is the Cliff Trail which involves a number of switchbacks. In the fallen leaves, it is also the most difficult to follow. It was navigated successfully by the Lil Kaintuckeean and I (I carried 3-year old Lil Miss Kaintuckeean). Fortunately, we were descending the trail which covers a quarter mile in distance and a descent of 140 feet! The trails begin from the gravel parking lot along a wide gravel path, through savannah grasses which once were the norm in central Kentucky. Paths diverge once you enter the woods, but the two main paths off of the main trail are the River Trail and the Overlook Trail. 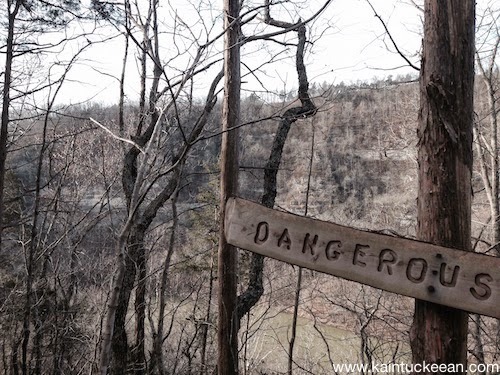 At Dupree Preserve's Overlook, a sign warns of "Dangerous Cliffs." Author's collection. We've completed the Overlook Trail twice and it is an easy trail to walk. I've seen others comment that a day at Dupree is more like a walk in the park than a serious hike; this is really true except that it works when you are outnumbered by children! The view at the Overlook is far more impressive than the one at Raven Run simply because of its panoramic scale, though the perspective does lack the curve in the river which dominates the view at Raven Run. Signs warn of "Dangerous Cliffs," but both a bench and picnic table allow for enjoyment of the beauty at a safe distance. 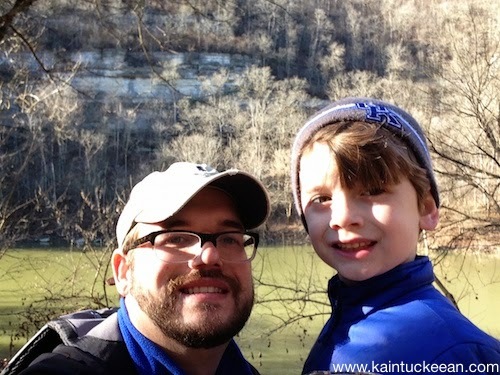 The Lil' Kaintuckeean and I at the bottom of the River Trail next to the Kentucky River. The long River Trail once served as a River Road from the crossing at river elevation where a ferry once operated at the end of the 1700s. According to the Kentucky River Guidebook, William Smith established a ferry on 200 acres he acquired in Garrard County "across from the mouth of Jessamine Creek." Much of this land became what is today the Dupree Nature Preserve. There is also a Meditation Trail, which I haven't yet had the chance to enjoy but which I understand contains a healthy dose of benches (as do all of the trails). 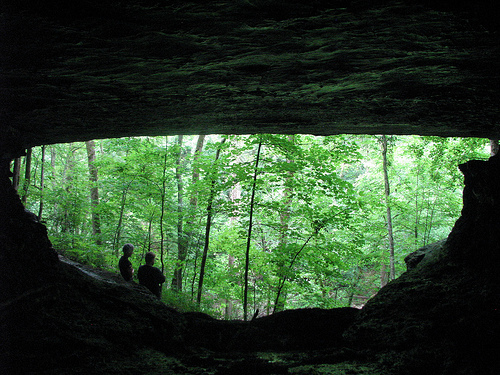 This region of Kentucky was originally surveyed by Daniel Boone. James Polly claimed some 400 acres in an area of Garrard County that still bears his name: Polly's Bend. In 1788, William Smith acquired 200 acres of this land. 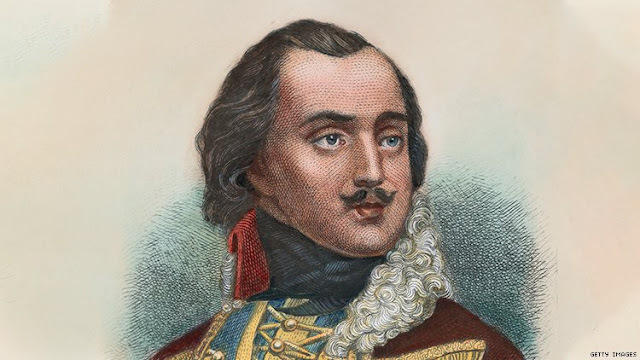 By 1790, he had acquired the frontage on the north (Jessamine County) side of the river and had begun a ferry operation which was handled by ferryman George William Downs. It became known as Down's Ferry. On April 23, 1799, the Jessamine County Court organized a commission to investigate the pros and cons of developing a road from "the seat of Justice" to Downs ferry. Ordered that Jonas Davonport John McKinny Wm. Campbell & James Curd or any three of them being first duly sworn be appointed to View the ground through which a Road is proposed to be conducted from Downs ferry on the Kentucky River to the seat of Justice & make Report of their Pro Conveniences and inconveniences as that will result as well to individuals as to the public if said Road be opened. The need for such a road, however, was diminished by 1802 when Downs, along with John Moss, leased Hogan's ferry and the old ferry at Polly's Bend shuttered. 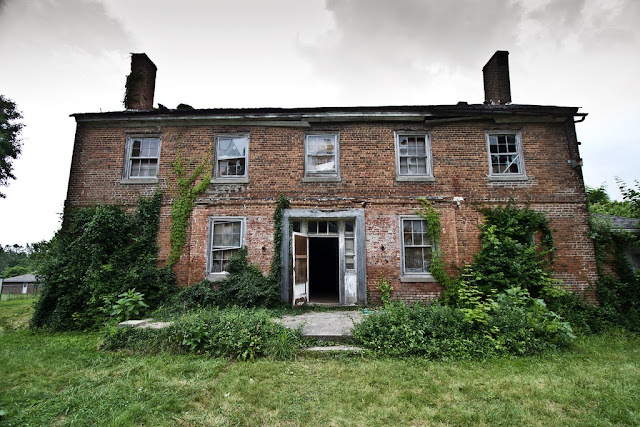 Hogan's ferry was at a far better location nearer an offshoot of the old Wilderness Road. Later Hogan's ferry would close after the Wernwag Bridge opened in 1838. 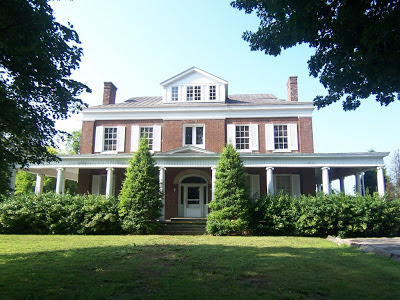 According to a History of the Dupree Preserve written by Lisa Conley, it was in 1863 at the site of the old Polly's Bend ferry where Martha Vaughn and Louisa Jackman risked their lives to deliver important information about Confederate activities to Union forces stationed in Jessamine County. Without their report, "the possibility is that the bridge over Kentucky River would have been burned." (Affidavit of W.N. Owens). 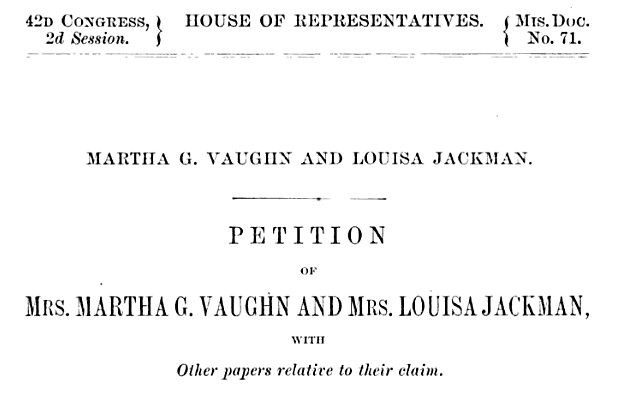 Record of Petition and Papers of Vaughn and Jackman. US House. For their contributions to the Union, both Vaughn and Jackman sought payment of their private claims by the US government. 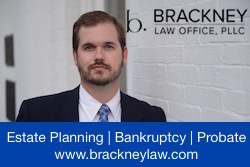 Their claims were postponed, referred to other committees, and denied on multiple occasions through various Congresses; it is unclear if Mrs. Vaughn or Mrs. Jackman ever received any remuneration for their service. It was that old Wernwag Bridge which was saved by their heroics. Spending time outdoors improves both mental and physical health in both children and adults. Research reveals that many cognitive skills are enhanced by giving children the opportunity to experience the outdoors and to exercise. What better place to do this than in a nature preserve? The kids along the trail among a grove of chinquapin oak. Author's collection. 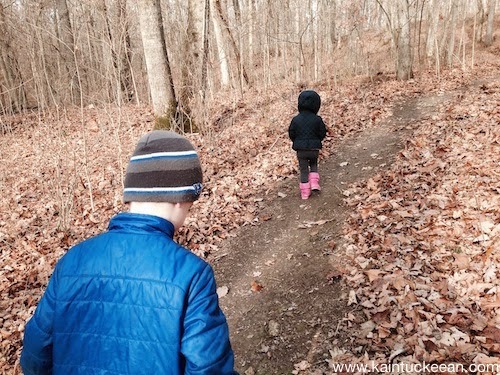 Dupree Nature Preserve's trails are laid out around the various sinkholes and other aspects of the land's karst topography, but the majority of the trail mileage is easy walking for kids and adults alike. Hiking at this Preserve is suitable for all ages. Future plans include a dock and a picnic pavilion. The dock could be especially popular as the Preserve is located the 42-mile Kentucky Blue River Trail. But whether you approach the Dupree Nature Preserve by foot or by kayak, it is a terrific place to enjoy a beautiful day in Kentucky.